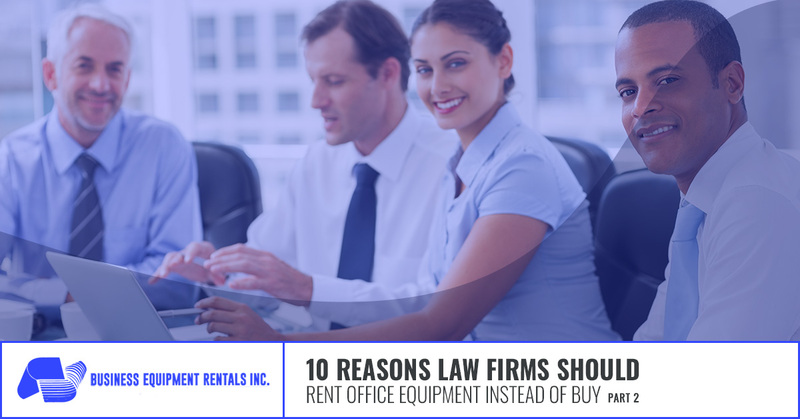 For your new law firm, there are many reasons to consider renting office equipment instead of buying it. When you’re starting any new business, there are a lot of different things to consider, from what space you should lease or buy for your firm to who you want to choose for your partners. One thing you’ll need to consider is whether you want to buy or rent your office equipment, and it’s important to know that there are many reasons to choose renting instead of buying. If you haven’t already, check out Part One of this series to learn about the first five reasons to rent instead of buy, and keep reading to learn more. Reason #6. Avoid having to pay more to update equipment in the future. Technology is fast moving, and in order to keep up with it, your law firm is going to have to keep your office equipment updated. This can get expensive, and it can get expensive fast. Avoid the need to pay for new equipment as updates are available by renting your equipment. When you rent, you’ll always have the latest, most up-to-date models, and you’ll do so without having to spend an arm and a leg. Reason #7. You won’t have to pay for or think about maintenance. You rely on your office equipment to work as it was meant to, but in order to keep running efficiently, many pieces of equipment require maintenance. Keeping up with the maintenance needs of your office equipment takes time and energy from your day. You could, of course, pay someone to come in and maintain your equipment, but that is just another added expense. Like with repairs, when you rent your office equipment, you won’t have to worry about maintaining it, because the rental company will do it for you. This not only saves you time, energy and potentially money, but also ensures that your equipment will work reliably. Reason #8. You’ll have an easier time acquiring financing for a rental. In our last blog, we talked about how renting equipment prevents you from having to take out more credit cards, loans or lines of credit than you need to. But, what we didn’t talk about is how difficult it can be to acquire the financing you need when your law firm is just starting out. Getting approved for a capital equipment loan can be tough because lenders usually require two to three years of financial records. Business rental companies do require some financial history, but it’s usually anywhere from six months to a year, which is more attainable for most new law firms. Reason #9. Buying office equipment is a gamble. In this blog series, we’ve talked quite a bit about how renting office equipment can help you save more money — especially upfront — than buying office equipment. Not only will you spend more right off the bat if you buy your equipment, but you’re also taking a gamble. If the equipment stops working or breaks down, it’ll be up to you to repair or replace it. If technology improves and renders your equipment outdated, you’ll be responsible for replacing it. When you rent instead of buy, you’re not only saving money, you’re deciding not to gamble away your investment. Reason #10. Take advantage of tax deductions. Tax time can be difficult for any new business, and law firms are no exception. But, luckily, renting your office equipment could help to make tax time a little bit easier. Thanks to Section 179 of the tax code, you can deduct the entire year’s worth of rental expenses from your taxes, whereas, you would only be able to deduct a portion of the expense to buy new equipment. 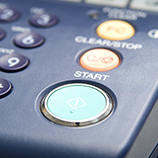 Plus, if you decide to deduct the purchase of office equipment from your taxes, you have to take depreciation into account, which can complicate your taxes. 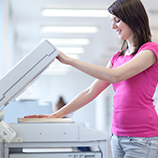 Let us help you find the office equipment rentals you need in New York City. 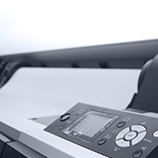 At Business Equipment Rentals Inc., we’re proud to be your premier source for office equipment rentals. We have all of the equipment you need, including shredders, printers, laptops and more, and we specialize in helping law firms build war rooms. Contact us today about your office equipment rental needs!